User account and authentication(UAA) is the process by which an application identifies a user, verifies his/her identity and then checks if he/she has the required permissions to access the application. This process is essential in ensuring the security of an application. 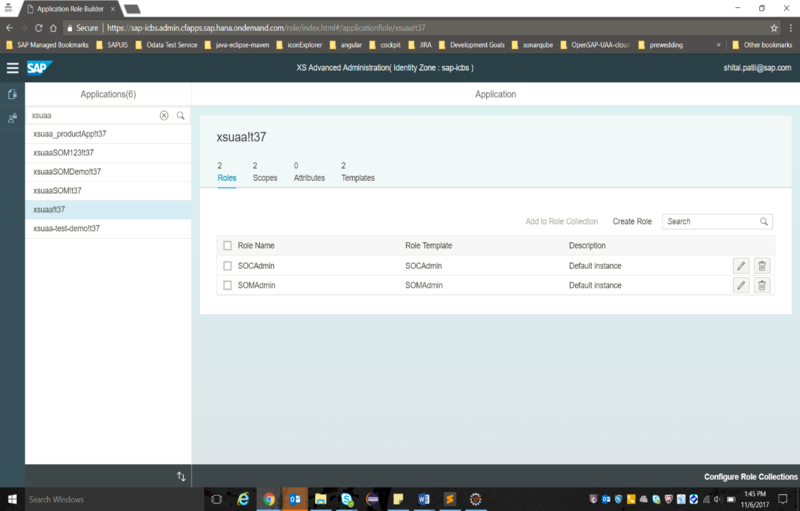 In this blog post, we explain the UAA setup process for an application that has its back-end as a Java application and the front-end/UI as a UI5 application. We begin with explaining the basics of the UAA process – the terminology, the services, the protocols and the flow. Following this, we look into the installation and setup of the Application Router and the configurations required in the Identity Provider to setup the user authorization. Lastly, we explain the process of securing the back-end service through assertions and how to access the same from the front-end/UI. Authentication – Proving you are who you claim to be (via password, certificate, token, single sign-on, etc.) SAML 2.0 is protocol used for authentication. Authorization – Authorization is the function of specifying access rights/privileges to resources. Authorization allows what you can do on the system, once you have been authenticated. OAuth 2.0 is the protocol used for authorization. AppRouter: Instead of letting the customer access this application directly, we will use the Application Router (App Router) which serves the following purposes. App Router is a general entry point into the application- routing requests to the required services/routes. Service Provider: Issues access tokens for the client to obtain the authorizations of the resource owner after he was successfully authenticated by a SAML 2.0 compliant identity provider. An access token represents credentials used to access protected resources. Identity Provider: Identity provider used for authenticating user. SAML 2.0: The Security Assertion Markup Language (SAML 2.0) is an open standard based on XML for exchanging authentication and authorization data of a principal (user) between an identity provider (IdP) and a service provider (SP). OAuth 2.0: The OAuth 2.0 specification defines a delegation protocol that is useful for conveying authorization decisions. OAuth is used in a wide variety of applications, including providing mechanisms for user authentication. JSON Web Token (JWT) (RFC 7519) is an emerging open standard that defines a compact token format for securely transmitting information between parties as a JSON object. This information can be verified and trusted because it is digitally signed with the private key of the authorization server (UAA service). A combination of SAML 2.0 and OAuth 2.0 was chosen to implement authentication and authorization for XSA security. The browser sends its first request to the business app and hits the approuter. The approuter considers this as the initial request, because a session id is not included. The approuter redirects the request to the XSA UAA component. The URL for the redirect is taken from the variable VCAP_SERVICES of the approuter environment. The browser sends the request to the XSA UAA component. The XSA UAA considers this as the initial request, because a JWT token is not included. The XSA UAA redirects the request to the SAML 2.0 IdP. The URL for the redirect is taken from the configuration which was maintained when the trusted relationship between XSA UAA and SAML 2.0 IdP was set up. The browser sends the request to the SAML 2.0 IdP. The SAML 2.0 IdP considers this as the initial request, because authentication was not provided. The SAML 2.0 IdP responds with a login page. The user enters his credentials and sends a request with his credentials. The SAML 2.0 IdP authenticates the user, creates a SAML 2.0 Bearer Assertion and includes it in the response. The response is redirected back to the XSA UAA. The browser sends the request with the SAML 2.0 Bearer Assertion to the XSA UAA component. XSA UAA considers this request as authenticated and uses the information of the Bearer Assertion to create a JWT Token and an “Authorization Code”. XSA UAA keeps the JWT Token and includes the Authorization Code in the response. The response is redirected to the approuter. The browser sends the request with the “Authorization Code” to the approuter. The approuter considers this request as authenticated and uses the “Authorization Code” to request the JWT Token from XSA UAA. The approuter uses his “clientid” and “clientsecret” to authenticate itself against XSA UAA. The XSA UAA component retrieves the JWT Token which was associated to the “Authorization Code” and includes it in the response. The approuter has now the JWT Token. It creates a session id and assigns it to the JWT Token. The JWT Token is added to the browser request and forwarded to the micro service. The approuter includes the session id in the response and routes the response back to the browser. Subsequent browser requests include the session id. The approuter derives the JWT Token from the session id, adds it to the subsequent request and forwards the request to the micro service. In this flow it is important to notice that the JWT Token never appears in the browser. This is achieved by the “Authorization Code”: with it, the user “authorizes” the approuter to obtain the authorizations – the JWT Token – from the XSA UAA component. The browser never needs to know about the authorizations, because the approuter enriches each subsequent request with the JWT Token, before the request is routed to the micro service. This alternative approach requires that you have npm installed on your machine (already installed if you using vagrant image for your vm). 2. Place the following package.json in your approuter directory. The xs-app.json file contains routes to backend service. All references to your service from your UI or any other host will have to prefix /service to the controller path. 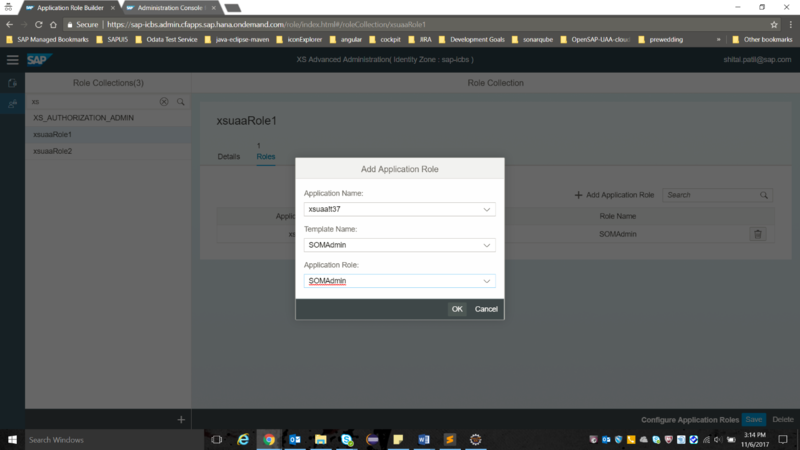 If you have multiple UI5 applications, then you can configure them with different source endpoints and “/” as the target for each. Within <destLocation> create a new yml file for the AppRouter microservice with the following content as reference. Be sure to check the validity of your manifest file using http://www.yamllint.com/. Manifest.yml file contains information about credentials of approuter, tenant host pattern variable, destinations, hostname, memory, path and services. The TENANT_HOST_PATTERN is a variable that declares the pattern how multiple tenants in the URL are identified and handled. 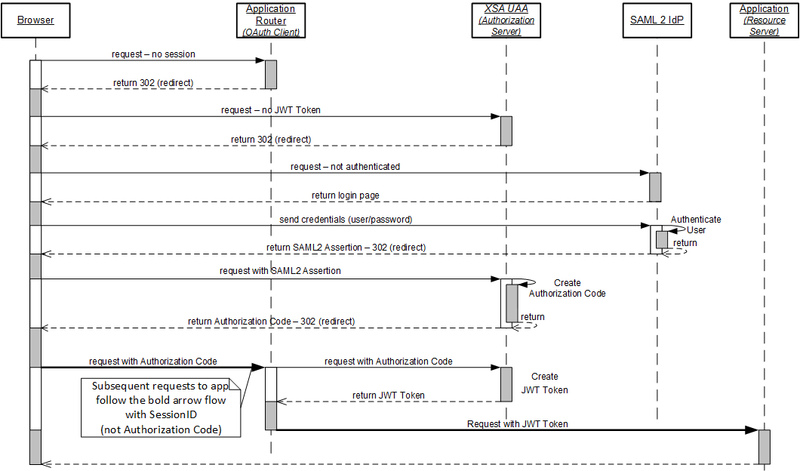 SAP_JWT_TRUST_ACL represents credentials for approuter. Destinations is a variable that declares the internal routes from the App Router to the underlying backend microservices.This app-destination is referenced by the previously created xs-app.json file. The Services section declares to bind our own XSUAA service instance to the App Router. This binding will ensure a corresponding VCAP_SERVICE entry that holds the client ID, client secret and public key that is required to validate any incoming OAuth token/JWT from the XSUAA service. Now we need to create a service binding to the XSUAA service. As a prerequisite we require a xs-security.json(security descriptor) file that contains a declaration about authorization scopes we intend to use in our application. We put this file to <destLocation>/xs-security.json. Note 1: The xsappname has to be unique within the entire XSUAA instance. Note 2: the variable tenant-mode:shared assumes a multi-tenant application and will require the TENANT_HOST_PATTERN variable to be declared. You may also use “tenant-mode”: “dedicated” if you develop a single-tenant application. Here we have defined two scopes and two roles respective to these scopes. Our Java application endpoints can be protected using scopes only and the application role builder at the tenant end only recognizes role templates. This is the reason for creating two role collections for both scopes. Later, we will map the groups that we will shortly create in the IdP (Identity Provider) to these role collections/templates. Note : To activate the multi-tenancy mode, the uaa instances of the applications MUST use the service plan “application”. Map the approuter route to repective tenant. Using following command. Setup the two-way trust between the tenant and your identity provider following these steps. In most cases, an existing tenant and identity provider and the configurations will be present. 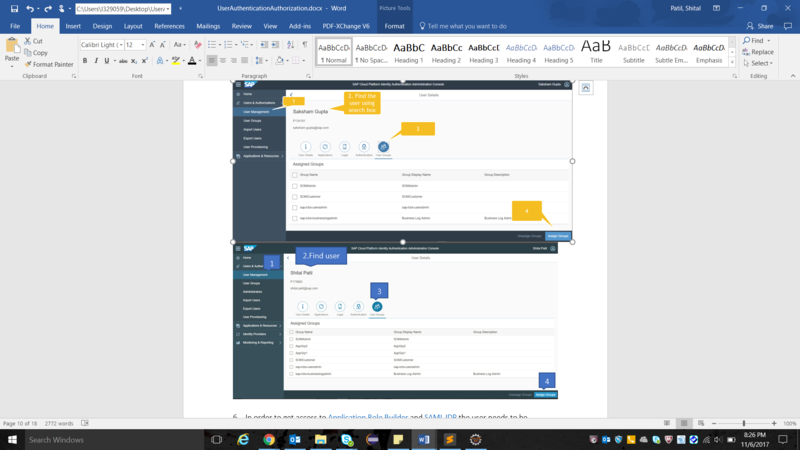 You need to have your application users in this identity provider in order to assign them to their respective groups. Each user can register here. Alternatively, users can also be created using User Management. Login to the admin console and setup the required user groups. Assignment of users to groups is done using User Management. Head over to the user in user management and then assign them the group using User Groups tab. 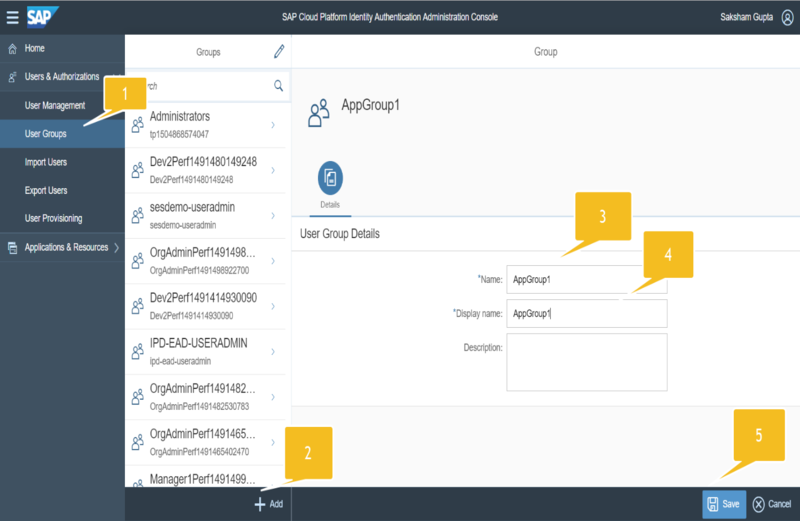 In order to get access to Application Role Builder and SAML IDP the user needs to be assigned to the admin user group. Click on Application Role Builder and go to Applications tab and search for the application name as defined in xs-security.json in the approuter in the “xsappname” . It will be appended with !t37. 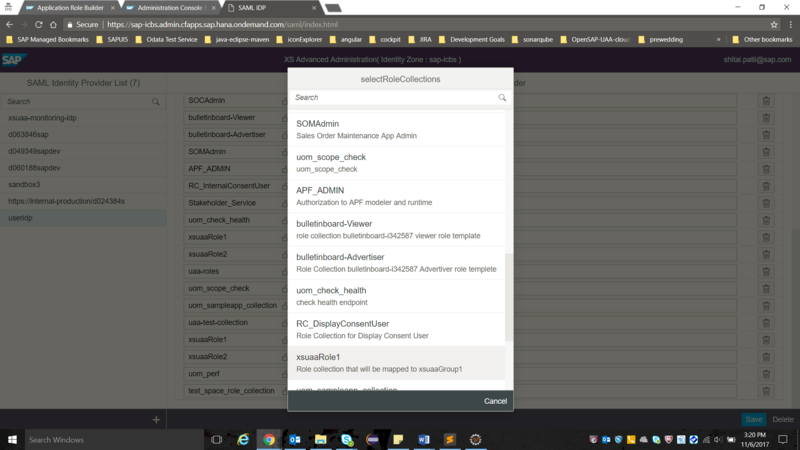 Click on Role Collection tab from the sidebar and create a role collection that will be ultimately mapped to the user group after being mapped to the application roles we specified in the xs-security.json which are in turn mapped to the scopes. 10. Click on the newly created role collection in the Role Collections tab. Go to the roles section. Add Application Role. Choose you xsappname!t37 and then chose the respective Application role that will be SOMAdmin in your case. Similarly create another role collection and add application role to the newly created role collection. 13. Create another Application Role (xsuaaRole2) and map it to AppGrp2 before hitting save. You can prevent unauthorized and/or unauthenticated users from accessing you Java service. 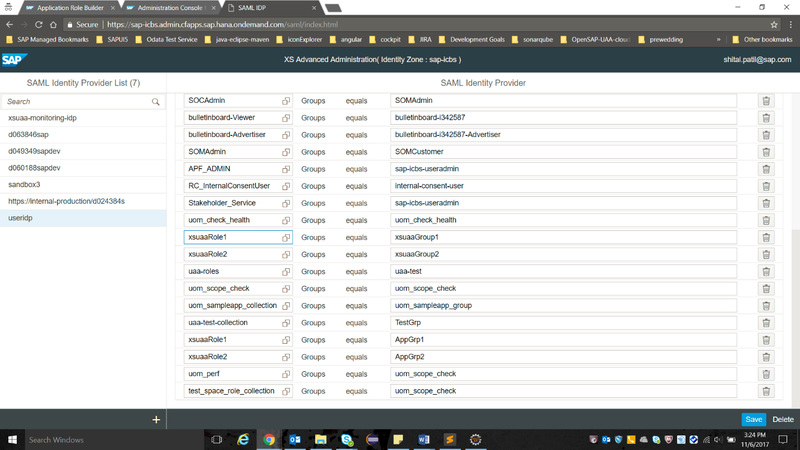 It is not necessary to protect a UI5 application if all the data is being fetched from the java service. 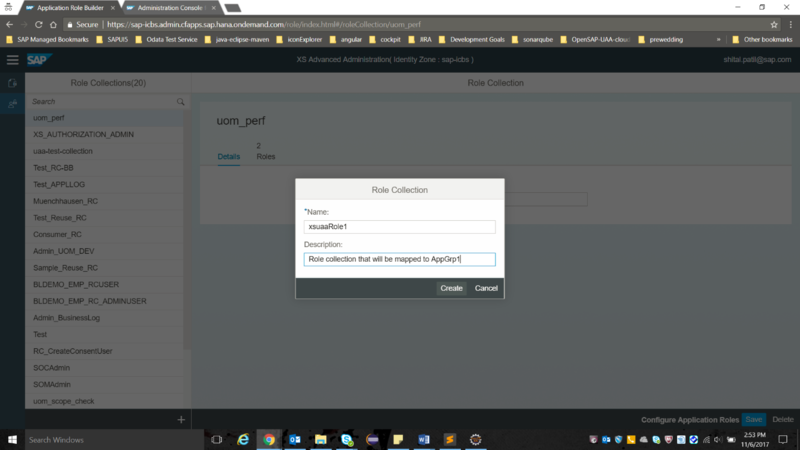 The UI will hit the java service through approuter itself and if your UI5 application has been configured as one of the destinations in xs-security.json then the authorization token will be forwarded to the UI5 application as well which in turn will be forwarded along with each request that the UI5 application makes to the java service. 3. In your java service’s manifest file, include the xsuaa service instance name as you mentioned in the approuter. Build and Redeploy your java app after adding this code and you should be getting 403 unauthorized when trying to access it directly. The same should work when going through approuter. If you have a UI5 application making ajax calls to your service then use the approuterurl/service/endpoint pattern as the url for your requests. GET requests will get served without the need of CSRF tokens but POST and PUT requests will require a CSRF token to be sent otherwise you will get a 403 Forbidden. We would like to acknowledge the guidance, support and effort put into the research of this topic by Saksham Gupta. He pointed us in the right direction and guided us throughout the research and implementation of the topic. We could not have taken this task to completion without his untiring efforts and research.